On Wednesday 13 September the Actuaries Institute, with support from the Risk Management Practice Committee, held the ninth Enterprise Risk Management (ERM) Seminar. 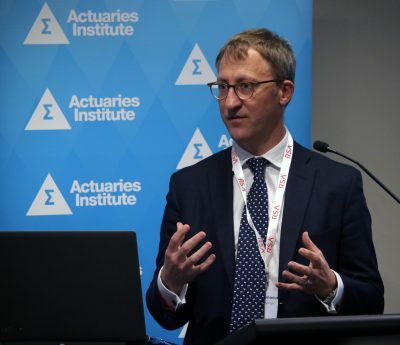 The conference was held the Forum at the Actuaries Institute’s Sydney offices and included an impressive range speakers and strong media coverage. Here, Nick Cowdery, from the Seminar organising committee, speaks with newly appointed Chief Risk Officer Colin Weir about his view of the Seminar content and its value to those in a CRO role. Like many in the profession, the members of the organising committee (pictured below) for this year’s ERM Seminar are all extremely passionate about risk management. 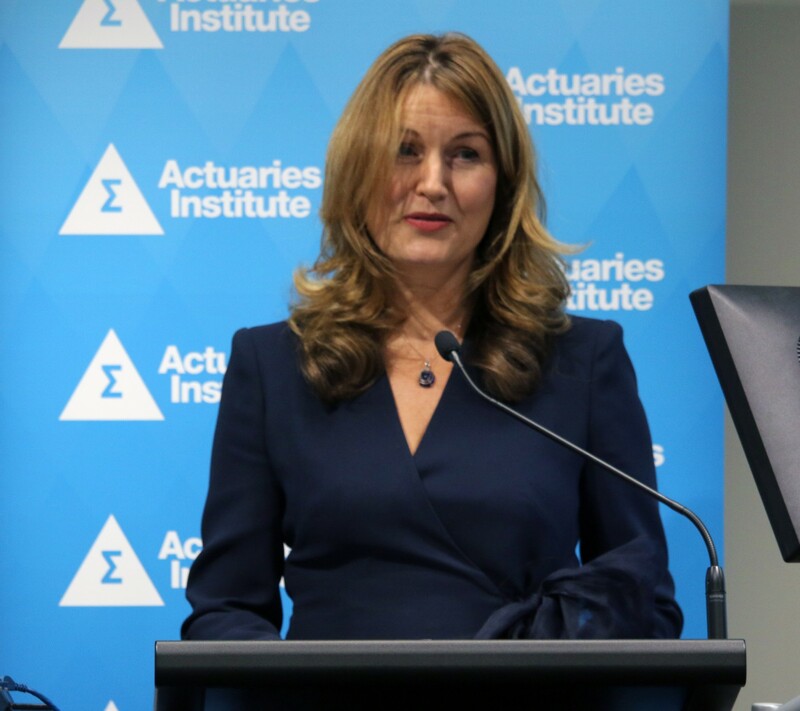 We are enthusiastic about the opportunities it presents for actuaries to use their core skills in another key practice area, and support an important function that protects the companies we work for. Of course, that isn’t to say that the current education system fully prepares us for all the real-world practical challenges that ERM presents. However, the core analytical and risk management skills of actuaries are better formed than they are in most other feeder professions to risk management. 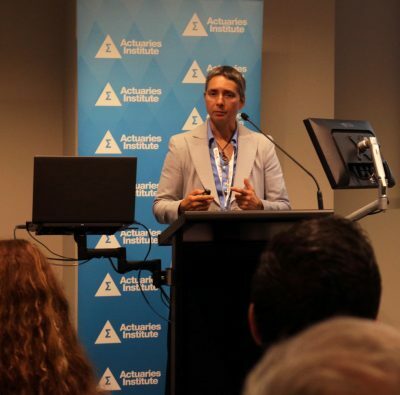 When we invite speakers to this event we are always mindful that they should address current topics in risk but also present some thought-provoking information about less well-known issues on the horizon. 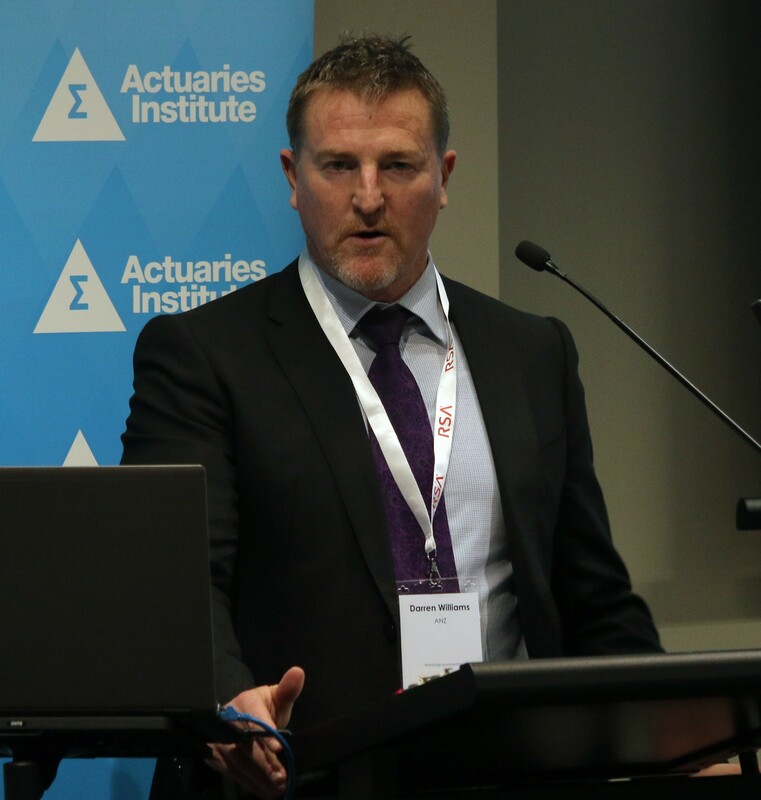 We aim for a balance between actuarial and non-actuarial speakers, and content that has a practical focus and is deliberately non-technical. This explains why over 50% of attendees to this seminar in recent years have been non-members. For this piece, I thought it would be interesting to hear from an actuary who attended the seminar and who has moved into the role of Chief Risk Officer (CRO). 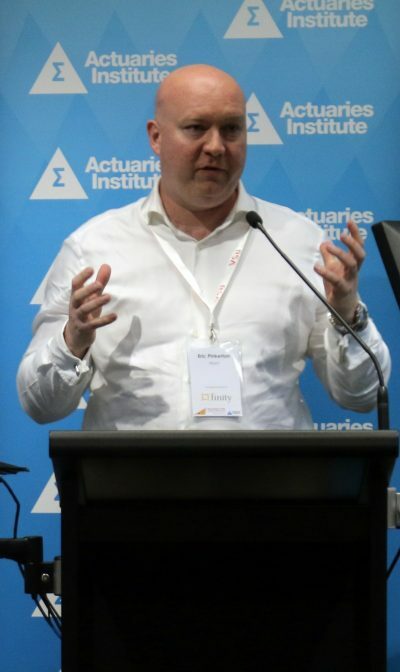 Colin Weir is currently CRO with SCOR Global Life in Australia, but has previously held a variety of more traditional actuarial roles in global locations, including the UK, India, China and Hong Kong. Given his experience, Colin is well placed to discuss the seminar content and the value the day provided to someone in a CRO role. Nick Cowdery (NC): So Colin, overall, what did you take away from this year’s seminar? Colin Weir (CW): To me, the morning sessions gave the sense of a risk management discipline that has reached a point of self-reflection and evaluation. Having now established the basic principles, we seem to be pausing to ‘look around’ before embarking on the next phase of evolution. 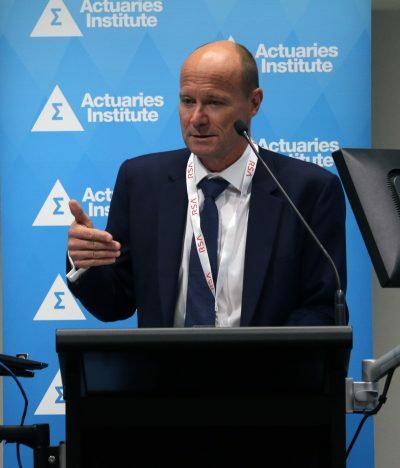 This impression started with the initial Keynote Address from Ian Laughlin, whose Presentation ‘(Fake)n News, Social Risk, and more’ posed the question “is conventional risk management working?”. Huge investments have been made in risk management and yet we see today unprecedented levels of customer dissatisfaction and regulatory intervention. Standards are admittedly higher than ever before and, through social media, society has a powerful voice, increasingly used as judge, jury and executioner. How do we modernise our toolset for this fast changing environment and, as Ian describes it, how do we move from “risk monitoring” to “risk sensing”? NC: Plenary One then discussed one of the major challenges facing Risk Management – Conduct Risk. Edward Emanuel presented some shocking survey statistics. The one that stuck in my mind is that “20% of the finance professionals surveyed would commit a crime if they knew they could get away with it”. It’s no wonder then that that regulators nowadays have such a focus on the culture within an organisation. As such, it was very helpful to have an update from both ASIC and APRA in Plenary Two on the work they are doing in this area. 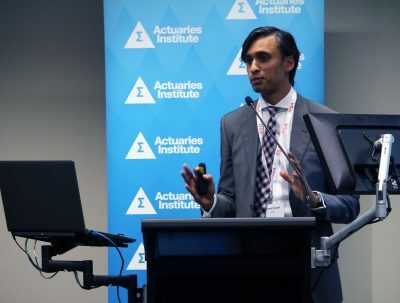 CW: As a Life Reinsurer, I was particularly interested to hear from Fahmi Hosain who provided an update on APRA’s new approach to supervising Risk Culture within their regulated entities. While the approach is still being fine-tuned, it is likely to be extensive when it is implemented for all regulated entities: three weeks of on-site work, staff surveys, interviews across the organisation, and listening-in on management and Board meetings. 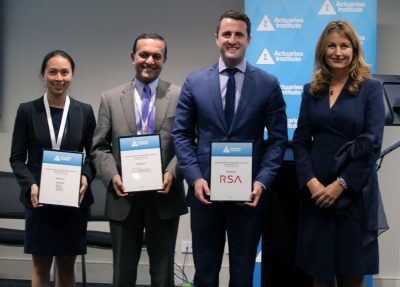 Through multiple data points from a range of different sources, APRA will form a view of the risk culture of an organisation, though APRA describe this as “holding a mirror up to the organisation”. NC: That session brought us to lunch, after which there were some interesting presentations on different threats posed across industries. CW: I enjoyed Eric Pinkerton reminding us that people are “Evil, Lazy and Unpredictable” and that Cyber risk is “100% a people problem”. Also, Tony Harb’s session on Crisis Leadership was inspiring. This is an area where, thankfully, most of the audience had little experience. Tony is clearly an expert in this area due to his role with the State Emergency Services and in consulting to a range of clients on this topic. NC: And we had an excellent panel for the Final Plenary exploring the Role of the Board in Risk Management. CW: Nicolette Rubinsztein’s introduction was itself like the “flashlight in a dark room” she described, extremely valuable for anyone interacting with the Board. (Furthermore, my daughter is currently reading “Diary of a Wimpy Kid” so her references to these books had extra appeal for me). This session nicely tied in with the theme of the morning, questioning the over use of quantitative analysis, which is easy to report. However, the real key to effective risk management lies in open conversations, often about risks which are difficult to quantify. NC: The seminar attracted a broad range of people from across risk management, with actuaries only comprising around half of the attendees. Do you think this mix of people brings different perspectives? CW: I do, and it is nice to see the common themes of the risk management discipline rather than just an insurance industry view. I was surprised to see that members of the press were so visible and, although I enjoyed the skilful way Ian Laughlin dealt with a tricky question from one reporter, I think this presence did stifle the discussion in some areas. So I understood why some presenters asked for their sessions to be closed to the media. Given the excellent program and the number of people working in risk management, it is a shame that the seminar didn’t attract an even larger audience. Hopefully that is something the organising committee can build on for next year, to support better networking opportunities at the event as well (e.g. over lunch). NC: So having personally made the move into a CRO position, what would you most like to see us address at the next event? 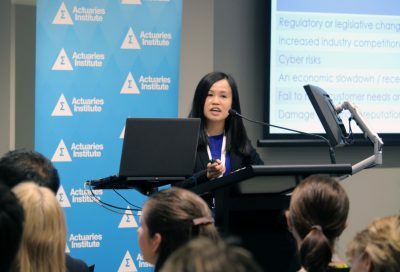 CW: This year, the seminar ticked all my boxes of “current hot topics” to be discussed, but it is difficult to predict what those topics would be in 12 months’ time, especially given the regulatory and political events still unfolding. 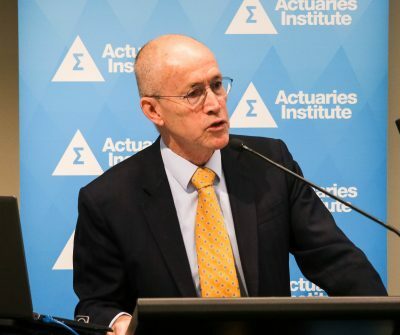 Global surveys indicate that Australia’s focus on “regulatory change” risks stand out from the rest of the world, where risks relating to “technological innovation” and associated “change management” tend to dominate. This could be an interesting area to explore further at next year’s event. NC: Thanks to Colin for his views on the day and to all the speakers who were kind enough to give their time and energy for the event. 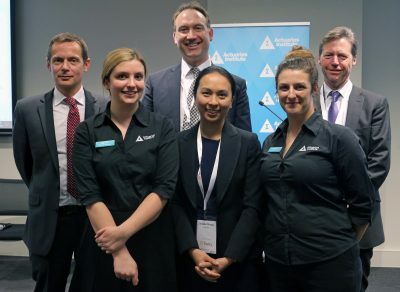 Thanks also to the Institute, the organising committee and sponsors (pictured below) for their tireless efforts and for making the day a success. Please don’t hesitate to let us know if you have any feedback or ideas as to what you would like to see on the event program next year. Please send any feedback to me at Nick@interactsearch.org. Audio and Video Recordings, plus the Presentation Slides from the Seminar are now available on the Program Snapshot Page of the ERM Seminar 2017 Microsite. Nick Cowdery is Director at InterAct Search. He has over 17 years experience recruiting professionals for Insurance, Actuarial and Risk Management roles in Australia and the UK. Nick has in depth knowledge in the Life, Non-Life, Risk, Investment and Superannuation industries placing candidates at all levels from analyst to CEO. More recently, Nick has developed an interest in exploring the way recruitment works for both employers and candidates. New tech solutions can make the process more effective and efficient and hopefully, more satisfying for all concerned....... Specialties: Sourcing candidates with risk, actuarial, quantitative and technical insurance expertise.